Early Birds really do catch the best selection! Check this year’s gift guide for handmade birdhouses, bird feeders and one-of-a-kind gifts for all nature lovers. 12 themes with 3 suggestions for each, find cool yard art, recycled metal and more ideas for thoughtful and lasting gifts… for non-birders too. 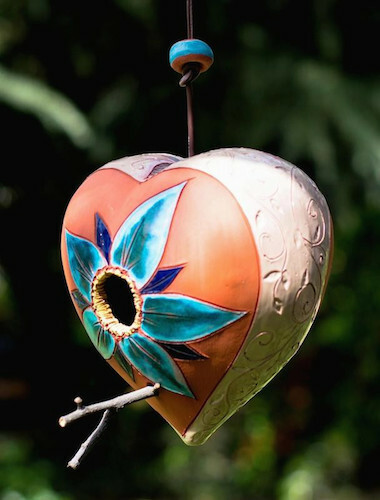 Birdhouses, bird feeders and birdbaths are gifts with purpose, providing an unplugged connection with nature for the recipient and helping to sustain wild birds with habitat. Gifts of nature are always a win-win and there’s never a worry of the dreaded re-gifting! And a Happy Thanksgiving to you and yours! For a swell holiday gift, here’s why unique birdhouses are sure to please! Gifts of nature soothe the soul, nothing to plug-in or download! Birdhouses for all tastes include classic or funky, modern or traditional, rustic, whimsical or just plain weird for the one who may be… well, a tad off! Materials range from wood, vinyl, glass, pottery, copper and recycled plastic. 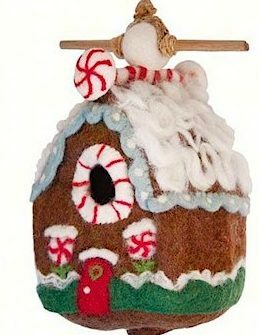 Even textiles make a cool birdhouse like this hand-felted gingerbread pick. 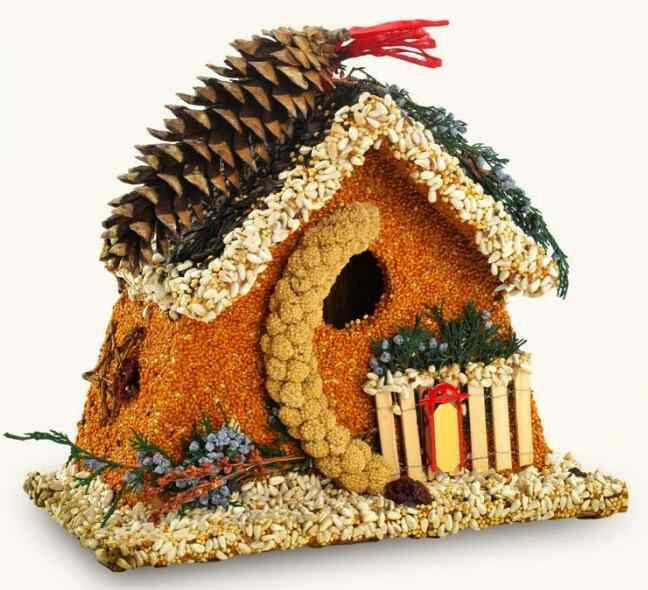 There’s edible birdhouses which serve as 2-in-1 gifts for use as a feeder now and a real wooden birdhouse for spring. Not all are created equal, but the Bed & Breakfast and Wren Casita promise to host many successful broods over the years! 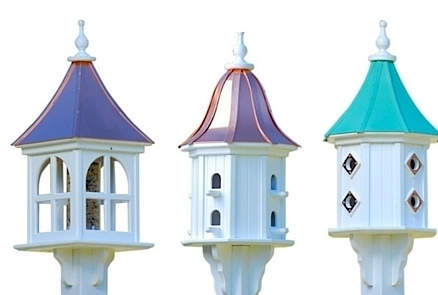 On a more classic note, go for these architectural birdhouses (matching feeders too). 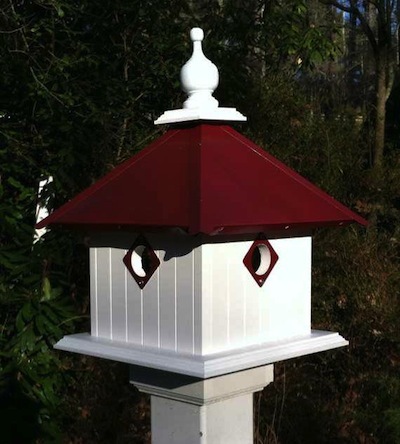 Stunning in the landscape and fine housing for feathered friends, these vinyl birdhouses are guaranteed for life. 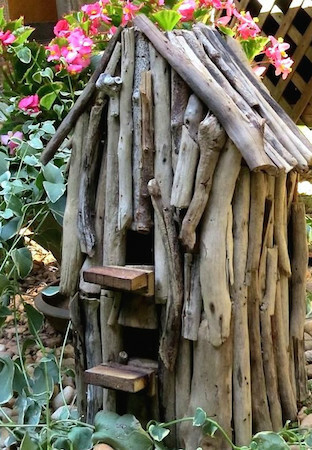 Some rustic birdhouses include driftwood from Indonesia, vintage church birdhouses and natural log front bird abodes. 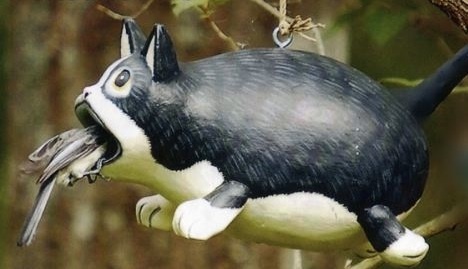 The latter replicate cavities in trees and snags where birds with no housing will seek safe digs to rear young. The salvaged logs are chosen for their uniqueness and deep openings. Forming a natural predator guard, they keep nestlings safe from intruders and cozy dry in the worst elements. Birdhouses serve friendly fliers well throughout the year. Aside from nesting in spring, most offer up a cozy roosting spot for cold nights. They add character to the garden and simply help feathered friends thrive! All in all, a totally swell idea for any nature buff on your list! Because they’re purchases with purpose! They add value and beauty to our lives and to those around us. They bring song, color and life to our spaces through those visitors who use them. Granted one will see more activity at a feeder, but real estate is scarce out there, so please help house the birds! Competition for natural nesting space is ever increasing, and most cavity-dwelling birds would be happy to raise their young and call any of these unique birdhouses “home”. Among those birds who use houses; bluebirds, chickadees, nuthatches, titmice, woodpeckers, wrens, finches purple martins and more. 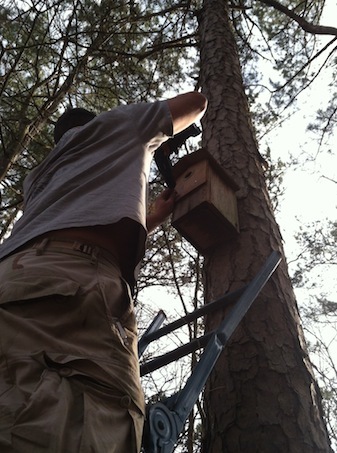 As a side note, owls, ducks and bats will take you up on man-made nest boxes as well. Because their habitats are also shrinking, providing places for shelter and successful broods can prove most rewarding. Styles range to suit all tastes, from basic to mod to vintage. 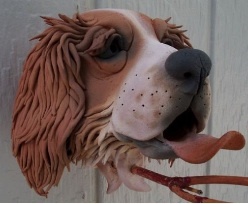 Materials are just as varied, from copper and PVC/vinyl, wood, ceramic, even driftwood! There’s absolutely something for everyone and something for every birdhouse-using species! 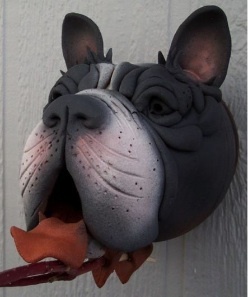 Those who don’t fancy birdhouses? Robins, blue jays, cardinals and goldfinches to name a few of the more common birds. But they’ll take up residence in trees, shrubs and hedges if the habitat suits them. They’ll use bird feeders and frequent your birdbath too. Let’s face it, housing isn’t for everyone, but birds who do use houses will try to set up shop in just about any cavity they deem good for rearing chicks. These include crevices in trees and older abandoned holes from woodpeckers and others who’ve already done the work of excavation. Especially favored among residents like bluebirds, chickadees, titmice, nuthatches and Carolina wrens (to name a few) are proper bird houses! 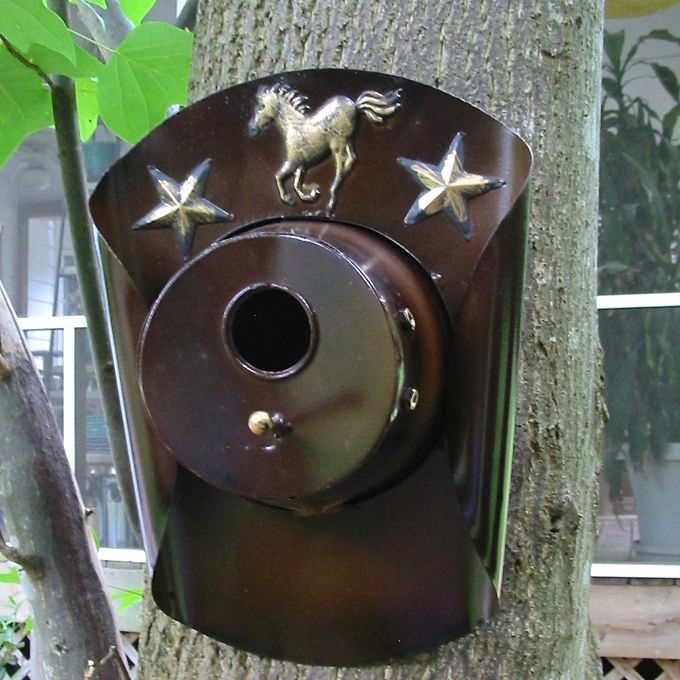 In early spring males will scout territory and nesting sites, from unique birdhouses to natural cavities, they look for suitable and impressive digs to entice a mate. Some will have only one brood or clutch, or nesting for the season, whereas bluebirds may go onto a 2nd or even 3rd brood! This is why it’s important to remove nests and tidy up bird houses once babies have fledged. So that the spot may be utilized again and maybe even again after that in a single season. The cowboy birdhouse would be pretty impressive for the Mrs.! It’s durable poly-stone (which helps regulate ambient temperatures) complete with bottom clean-out and 1.5-inch entry. Plus it’s cute as all with western flair and fine detail. 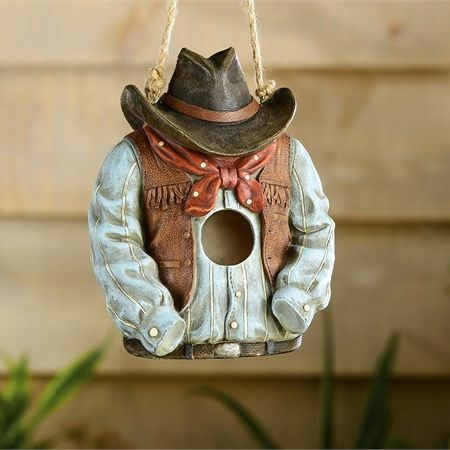 A little larger scale but still great space for a bird family is the cowboy hat birdhouse! This one’s metal so it’s best placed in the shade. 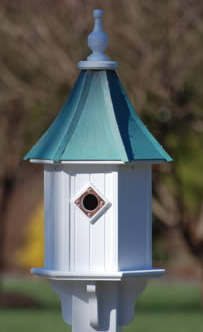 Actually full sun on any birdhouse can be detrimental in summer’s heat. Always best to minimize direct exposure to early morning if possible – avoid late afternoon sun at all costs… it’s just too hot for nestlings inside the house. Keep your bird houses up through winter as they provide ideal roosting spots on cold nights and protection from predators. Although migration is underway for many species, resident birds will stick around through winter if the habitat is suitable. You know that saying a day late and a dollar short? Well for once we were early, so if this post resembles a previous one… it’s because we got too excited and jumped the gun on launch date! 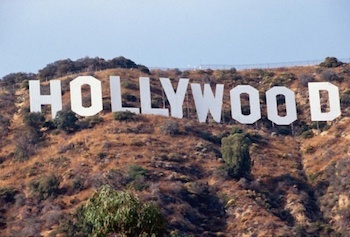 Folks can now make their way to the big screen, thanks to a new innovation in mobile advertising. But it’s not mobile as in phones, it’s mobile as in wheels. Daily sensory overload is apparent, but Zeusvision is something new and cool that will grab your attention. Extreme by all means, they’re 40-foot buses with a 31-foot digital screen on each side. Buses are complete with top-notch audio systems delivering fab sound as well. To experience this up close is to experience something pretty amazing! The means can serve for public messaging where anyone could get their personal words or commercial ads seen in crowded public spaces. 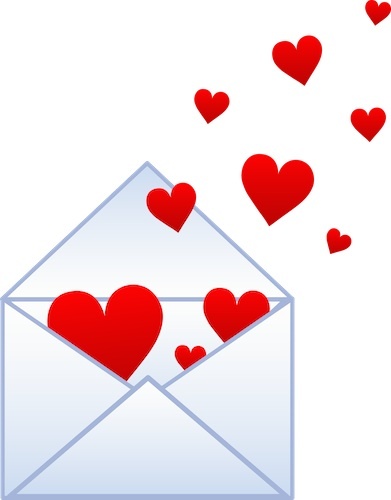 Ads are just one example; a football mom could use them to congratulate her son’s team on their championship, announce a wedding proposal in a big way, or just say something special in a larger-than-life manner! This innovation makes big media accessible to everyone, because your words or product may be worthy of something more than a post on social media. Big city outdoor ads are owned by huge companies because of the price tag associated with prime real estate. That’s why they run their buses in these prime locations. Hustle-bustle cities like New York, Los Angeles, Hollywood, Santa Monica, and Beverly Hills are just a few, with new markets being added. And because it’s an affordable service for individuals and smaller businesses, we’re thrilled to put these unique birdhouses on the big screen. How cool is that? 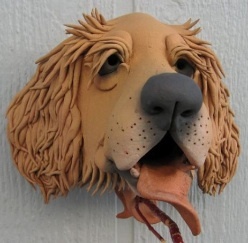 Man’s best friend immortalized in a functional bird home… and up on the big screen to boot! As a side note, this was posted in return for some advertising… they never made good on their promise. Big fat thumbs down for this company. Wood Birdhouses Ought to be in Pictures! With so many groovy new innovations out there today, many folks’ ambitious dream of making it to the big screen is now within reach! Though most of of the articles here are informative (we hope so anyway), they’re also a means of advertising and getting folks to our main website. 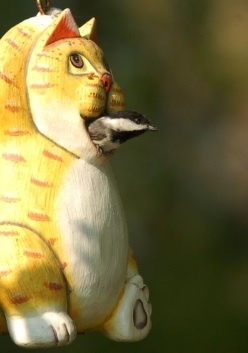 We think some of our wood birdhouses are worthy of the big screen… enough for a second look, even if to say “what the heck?” Birds find them pretty swell places to raise their young, and they do seem to evoke a smile from cat enthusiasts. So check out what we stumbled upon. Of the sensory overload bombardments we’re hit with daily, Zeusvision is something new and fun. Extreme, these are 40-foot buses built from chassis up with 31-foot digital screens on each side. Buses are complete with top-notch audio systems delivering the best sound money can buy. To experience this up close is to experience something pretty awesome and unusual! The platform can serve for public messaging where anyone could get their personal words or commercial ads seen in crowded public spaces. Ads though are just one example; a sports mom could use it to congratulate her son’s team on their championship victory, announcing a wedding proposal or birthday, or just say something special in a larger-than-life way! The innovation makes big media accessible to everyone, because your words or product may deserve a tad more than a simple post on social media channels. Big city outdoor ads are clearly dominated by large companies due to high costs associated with prime real estate. So they run their buses in these prime locations as well. New York City, Los Angeles, Hollywood, Santa Monica, and Beverly Hills are just a few, with new markets being added continuously. Over 4 months later, this cheesy company went back on their word. After providing artwork for the ads… they failed to run anything. Thumbs down guys! Who Uses Those Fancy Copper Roof Birdhouses? Some birds use houses and some just couldn’t be bothered. Well, it’s more along the lines of instinct let’s say. 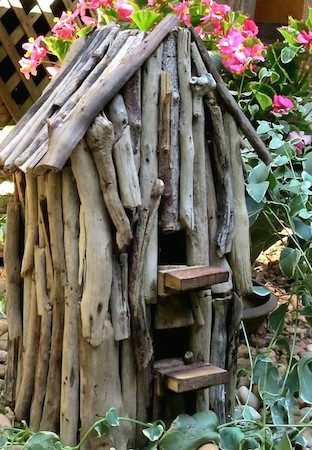 Just as some folks have houses for birds, while some prefer an elegant birdhouse on their property. It’s because of the aesthetically pleasing design and great quality they look so perfect in the landscape. 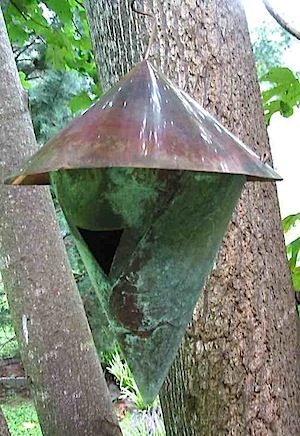 But these copper roof birdhouses are definitely meant for the birds! Bluebirds or tree swallows are likely to use a single entry home, with good chances of titmice, nuthatches or chickadees taking up residency in these, or even a triple-entry style. You’ll never find goldfinches, cardinals, robins or jays setting up house in one of these beauties though. Their preferences are hedges, shrubs and trees. On a more stately scale, martins are likely to nest in a larger house with 8 or 12 entries, often referred to as dovecote styles, but we promise… doves will never use them! The only doves around our yards are mourning or ring-neck doves. On an extremely rare occasion, a white dove may be spotted-but these are domesticated and used for release at weddings and special events (not a fan of this practice). keep it indoors for decor… but over the years we’ve heard this and seen this, and it’s kind of sad because we’re bird freaks-but to each his own. Chocolate and vanilla, right? 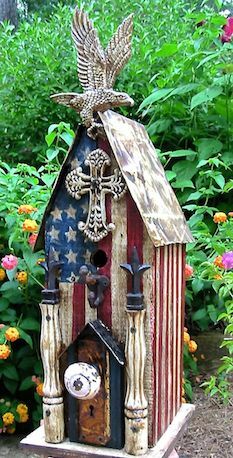 Happy 4th ~ Save 10% on Unique Birdhouses and Everything Else! 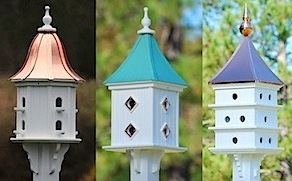 Save 10% Site-wide on unique birdhouses, feeders, bird baths… and everything else! For pets, fireworks are horrifying, it’s animal control’s busiest weekend of the year. 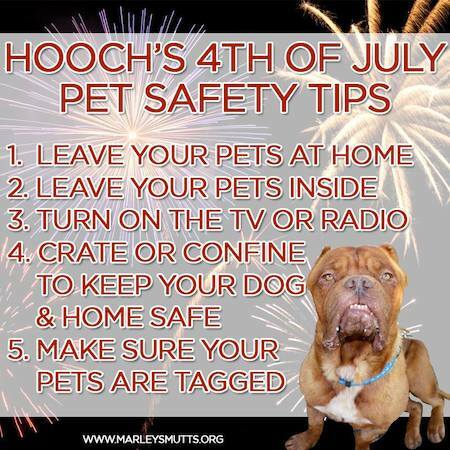 From MarleysMutts, here’s a few tips to keep your pets safe this weekend. Wishing all a Happy and Safe 4th of July Weekend! Okay, so maybe this one’s not so decorative, but it’s popular among downy woodpeckers. In time for nesting season 2014, it’s getting a facelift complete with metal predator guard… thanks to squirrels, and my neighbor, Tom. Because the guard was attached without measuring the roof line (duh!) he re-fashioned it to fit perfectly under the roof. Our downy’s say thank you! 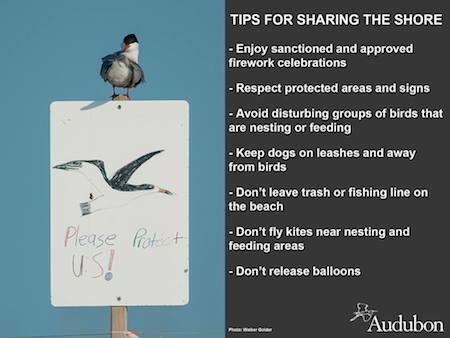 Although it may not seem like it… nesting season is under way! Even though there’s still snow, bird’s instincts tell them it’s time. With just a day or two of warmer temperatures and sunshine, there’s already less activity at feeders and more time spent scouting and claiming nest boxes. Here’s one of our new decorative bird houses that won’t need repair because it’s vinyl and comes with metal predator guards already attached. In a stunning Merlot color for spring, it’s like a two-for-one, it will host two families in the dual nest compartments. Four entrances with two bedrooms are perfect for chickadees, bluebirds, titmice and other small backyard birds. Townies, the birds who live in the burbs are more likely to see early successful broods and fledges this year than their counterpart county birds. Townies have it good, with feeders, water and housing offered in many scattered backyards. Country birds have a tougher go of it with the miserable weather and what looks to be, a late spring. We hope for the best. Competition for nest sites is tough out there! It’s a great day for deals across the net, free stuff with orders galore! The trick is finding that special something for the one who has everything. If they happen to be tree huggers, or even the least bit into wild birds… look no further! 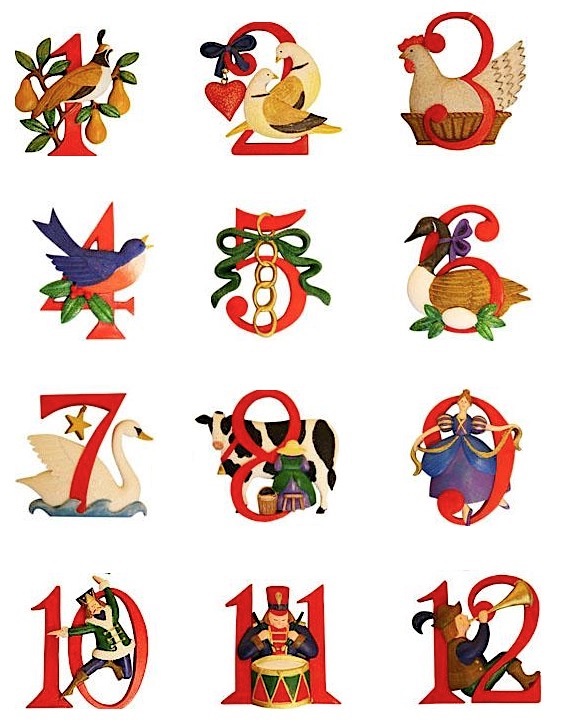 Holiday wooden birdhouses are guaranteed to bring big smiles, and for the birds too. Even though we’re not anywhere near nesting season, these fun bird homes make awesome roosting spots on cold nights. They’re gifts that last and actually get utilized. 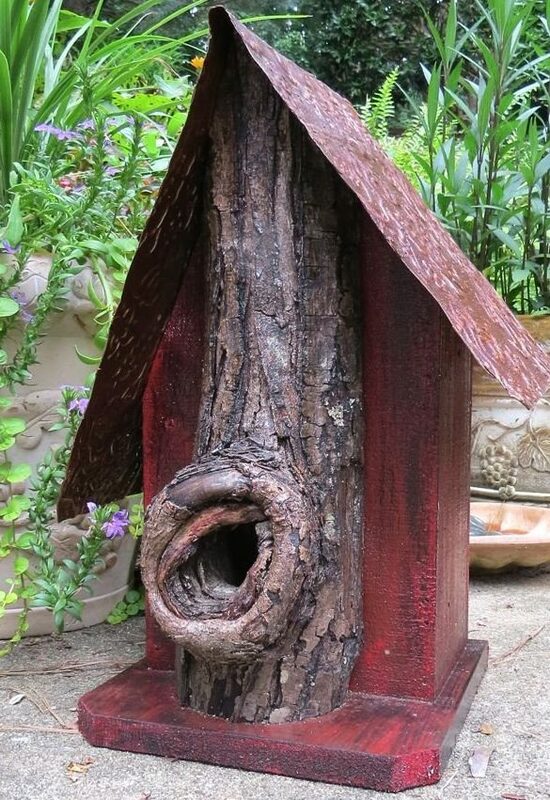 Edible birdhouses are another fantastic idea too, you get the feeder plus a real birdhouse once the seed’s consumed. They’re festive, colorful, and oh so fun! 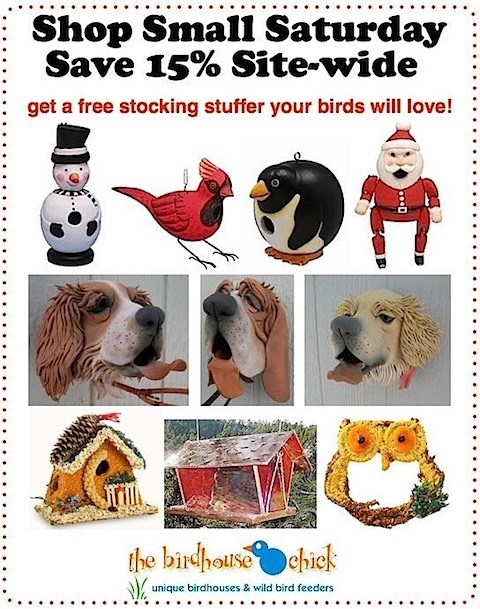 Add in free shipping, plus a stocking stuffer the birds will love, and oh yeah… 15% off, and that’s a sweet deal! Shopping small definitely has its benefits! Use code bb15 now through Monday, Dec 2 to take advantage of this sweet deal for the holidays!